Free workshop for all ages. Explore Turf’s current art exhibition ‘Last words, so it goes’ with curator Jack Friswell and exhibiting artist Linda Persson. Throughout the afternoon, take part in making camera obscuras to create a collective expanded projection. Materials will be provided, but you can bring along any other materials you wish such as phones, glasses, stories, stones, or other small and objects. Watch and discuss a selection of material from remote cultures to our own homes and explore how the re-appropriation of new and old technology is informed by their own history and beliefs, looking closely at the way we gesticulate and make sense of new and found objects through ritual and in relation to other objects. The workshop is presented in relation to ‘OPALSTONE’, a recent project by the artist Linda Persson currently part of Momentum 9, The Nordic Biennial of Contemporary Art, 17/6-10/17. The installation is shaped by three years of research in outback desert Australia. 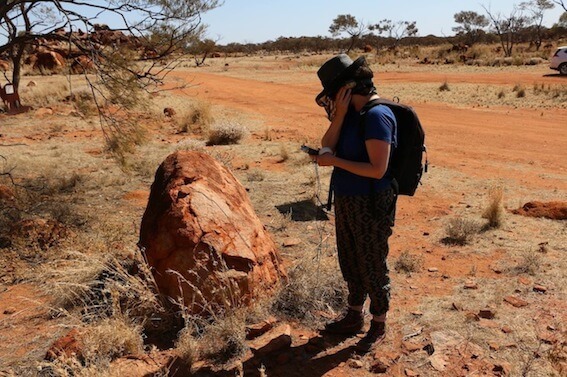 It draws on the historical, cultural and mythological contexts around indigenous land and the mining industry, which is heavily linked to the development of digital technology and its ‘immaterial affect’. Linda Persson is a Swedish artist that lives and work between London and Stockholm. She first studied Sculpture at Chelsea College of Art and Design, London followed by a MFA in Sound and Sculpture at Southampton University, Winchester School of Art. Between 2011-12 Linda was awarded a funded research year at the Royal Institute of Arts Mejan Residents in Stockholm, Sweden. Her work often focuses on questions of that which is historically repressed, about to disappear, or maybe already extinct, such as certain languages or technologies. Linda has exhibited and performed work in Luzern Kunstmuseum, Switzerland, Venice Biennial at Imago Mundi group show, Italy, Canopé Canopy, New Zeeland, Drawing Room, Dilston Grove, SPACE London, Galerie Nordenhake, Stockholm, Kalmar Konstmuseum, Haninge Konsthall, Sweden, Sámi Dáiddaguovddáš / Samisk senter for samtidskunst, Velferden Sokndal, Norway, Kunsthall44 Denmark. She has upcoming exhibitions at Momentum Biennial 2017 and Western Australia gallery 2018. She has participated in residencies at IMA gallery, Brisbane, International Art Space, Perth, Sunsiz Media, NSW, Australia, Skaftfell Visual Arts, Seydisfjördur, Iceland, Ricklundgården, Royal Institute of Arts, Sweden, Treignac Projet, France.